After the old familiar song Auld Lang Syne rings in the New Year, we reflect on 2017 and where we are going in the coming year. One important goal to consider is sprucing up our home. Your home is your single largest investment, providing safety, security, and comfort. Maintaining a home can add years to its life and generate energy savings. To take care of your home, consider writing goals and tactics to make it happen in 2018! Specific – What is your goal? Is it specific enough or is it too broad? What needs to be done for you to achieve your goal? Why do you want to reach your goal? Measurable – How can you measure your progress? How will you know if you’re on track? Attainable – Can your goal actually be achieved? Realistic/relevant – Can you achieve your goal? Is the goal worth it? Time – What’s your time frame for reaching your goal? To reduce my energy costs, I will replace all ten windows by May 2018. 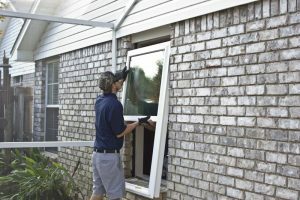 To design my window project, I will set up an appointment with a reputable window company by February 2018. To save up for my window project, I will investigate finance options or create a monthly savings plan. Are you ready to consider an energy upgrade? Energy-efficient vinyl windows can save up to an additional $540 annually to heat and cool your home. * Not only will you benefit from a warmer home in winter and cooler home in summer, replacement windows are virtually maintenance free and provide additional sound barrier to outside noises. For over 20 years, Majors Home Improvement specializes in window replacement and will help you make your home’s goals a reality. Contact us to learn why we deliver a Red Carpet service to give you piece of mind for years of enjoyment. * Calculated for a power bill of $150 per month. Doran, G. T. (1981). There’s a S.M.A.R.T. Way to Write Management’s Goals and Objectives. Management Review, 70(11), 35-36.